We see that you are still with us so you must have found our site interesting....we'll be looking for you. Imagine a pasture filled with over 100 beautiful broodmares, frolicking foals by their sides, and off in the distance, longhorn cows with their colorful calves grazing peacefully. It is an area of abundant wildlife, great whitetail deer, and wild turkey roams the hillsides. These sites could be found in the mountain valleys of Colorado, the plains of Wyoming or the prairie grasslands of South Dakota. But you'll also find them in the rugged hills of Southeastern Iowa on the Kokjohn Ranch. We are not computer people. The first two items above are why we built River Valley Horsecamp and the third item is why a good friend did this web site rather than us even considering to attempt it ourselves. The third item will also come into play on the "Contact Us" page which we hope that you read later. Ok, now that we have that out of the way how about some information about us that you might actually care about. We live just about one mile south of Farmington, Iowa, (only 1/2 mile south of the campground) where we have our ranch with an extensive horse breeding program with over fifty (50) foals available for sale each year. We also have had two (2) horse operations in Estes Park, Colorado for more than thirty years so we are certainly not new at hosting guests. In fact the Colorado operations enjoy guests from all over the United States as well as from foreign countries and we hope and expect this new Iowa business to do the same. Jessi, one of our two daughters, currently runs the Estes Park, Colorado operations which are National Park Gateway Stables and Cowpoke Corner Corral which has given us time to build the River Valley Horsecamp here in Southeast Iowa. Our other daughter, Johi, and her husband Brock also reside in Colorado and are busy raising our two grandsons, Cort and Luke to be our youngest wranglers. 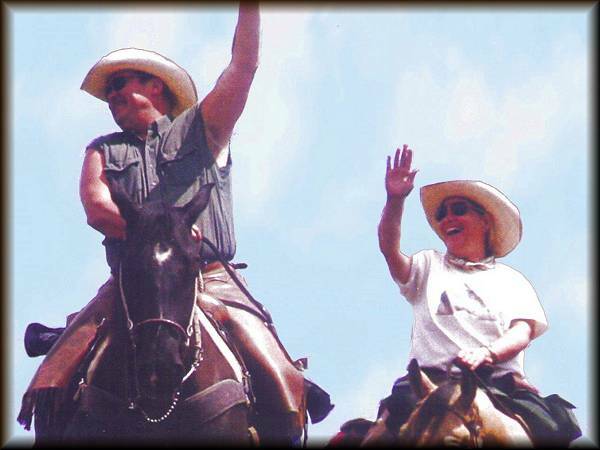 We have traveled extensively over the years visiting many horse camps, campgrounds, and various lodges. In fact, our very favorite pastime is to go camping with our horses. What we have attempted to do here (and hopefully succeeded) is to bring together all of the conveniences and amenities that we have seen and liked in other locations and then added what we thought was missing in those other locations. As you navigate through this website we think that you will find that River Valley Horsecamp has something for everyone. We invite you to look the site over and then contact us to book the lodge and/or a campground site. Of course you are welcome to contact us just for additional information or even just to say "Hello".